The vertical approach has been used since April 2000. The first 100 cases , from April 2000 to July 2001, were carefully evaluated and the results are as follows. (i.e., 4.2 cm on each side). The distance between the retroauricular sulcus and the hairline was measured at the Frankfurt line level in ten patients before and after surgery. The backward displacement ranged between 0 and 3 mm. In these ten patients, the mean displacement between the ear and the hairline was therefore only 1.5 mm (Fig. 47.9). The early complications were limited. and retroauricular, with no known disease or coagulopathy symptoms. 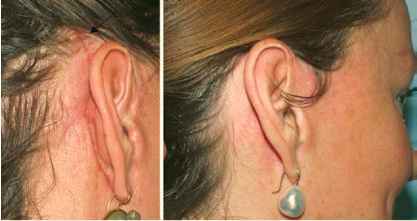 The first patient developed a hidden retroauricular hypertrophic scar, and the second had some visible scars below the ear lobe. Two hematomas requiring evacuation occurred, but only two patients required aspiration of fluid in the cervical area. One postoperative cervical infection on the ninth day was observed on one side. The retroauricu-lar incision was opened by a general surgeon for evacuation of the abscess, drainage, and irrigation; it healed uneventfully. The scar remained well-hidden, being restricted to the retroauricular area. In five patients, retroauricu-lar skin folds were observed, especially at the beginning of our experience. These gradually improved, and only one required revision (Fig. 47.10). There was no hair loss in the undermined retroauricular scalp area, whereas some temporary hair loss was observed in the temporal area in about 10% of patients. Two hypertrophic scars were observed, creating a few folds. No patient complained of pain or sensitivity problems in the retroauricular area. Thirty-five patients were reviewed for follow-up at 6 months. 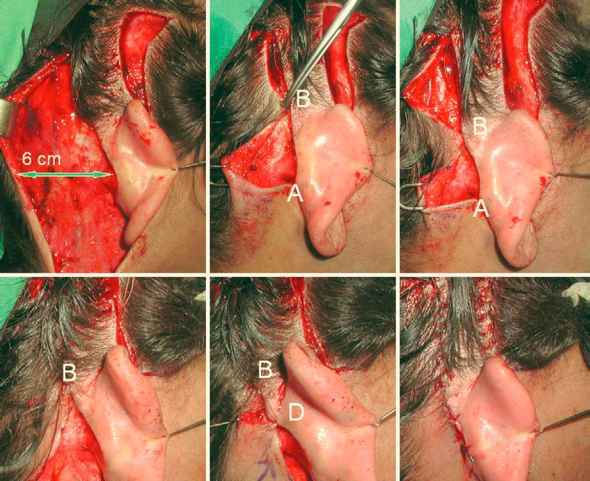 The scars were of extremely good quality in the retroauricular sulcus. The vertical component between the sulcus and the hairline was well-hidden by the ear in all cases, and it was necessary to pull the ear outwards and lift the hair to see it. The scalp portion was also of good quality. 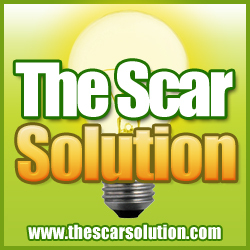 There were no cases of enlarged or distended scars (Figs. 47.11, 47.12). 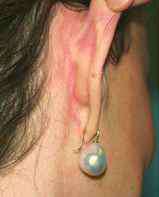 In most patients, the retroauricular area was flat, with a linear scar. In five patients, there were a few posterior folds. They were all well-hidden behind the ear, and only one patient requested revision, which was easily done by elevating the posterior edge and resecting the extra skin. 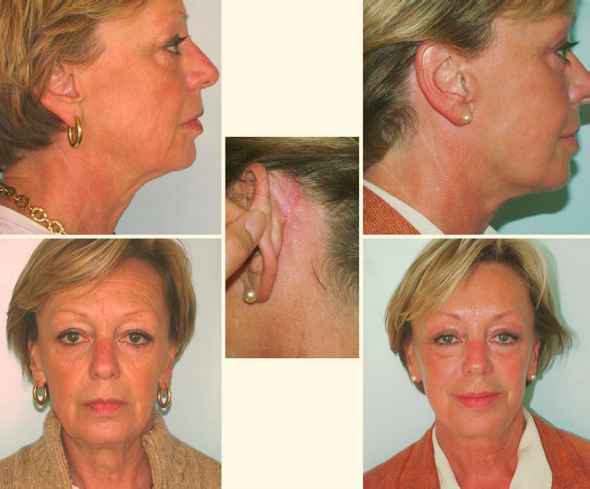 The overall result of the face and neck lift was good, equivalent at the neck level to the previous approach with a transversal incision (Figs. 47.13, 47.14). 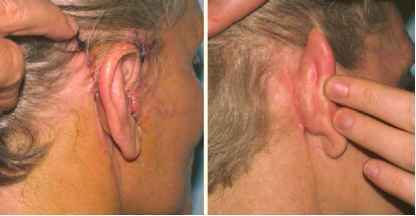 The patients expressed their satisfaction at having no visible retroauricular scars. This was true not only for the primary cases (26 out of the 35 cases reviewed) but also for the nine secondary cases. temporal downward triangle. The temporal horizontal scar is sion of the editor of Plastic and Reconstructive Surgery) not visible, hidden by the downward movement of the hair.